New Scene to Scene Spirit DataCine and Da Vinci color corrected transfers to High Definition done especially for this publication at Technicolor, New York. 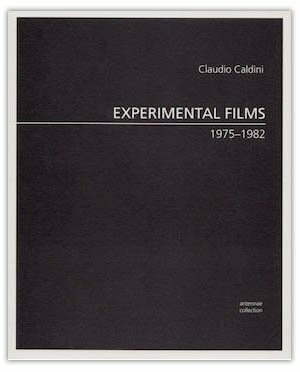 Claudio Caldini was born in Buenos Aires in 1952 and has been making experimental films since 1970. In 1971 he began his studies at the Centro Experimental del Instituto Nacional de Cinematografía (Buenos Aires) and attended film seminars with Alberto Fischerman (1977), Werner Nekes (1980) and Werner Schroeter (1983) at the Goethe-Institut (Buenos Aires). He studied Modern and Audioperceptive Dance with Rolf Gelewski in Salvador da Bahía and São Paulo (Brazil), in 1978 and 1982, respectively. Caldini worked as a lighting designer and operator for theater and rock concerts and as a programmer of electronic instruments, in association with Jorge Haro (1989–90). He was the film and video curator at the Museo de Arte Moderno de Buenos Aires (Argentina) from 1998 to 2004, and a member of the Jury of the 2003 International Short Film Festival Oberhausen (Germany). In 2005, he was an Artist in Residence at the Glenfiddich Distillery in Dufftown (Scotland). He is the recipient of the following awards: the Premio Leonardo from the Museo Nacional de Bellas Artes (1997); Beca de la Fundación Antorchas (1998); the Gran Premio at the III Festival Franco-Latinoamericano de Video Arte for his work Heliografía (1994); and the Primer Premio at the Primera Semana del Cine Experimental, ARCO ’91, for his work El devenir de la piedras (1991). We are particularly interested in drawing attention to both established and little known artists in dialogue with critical essays that propose cultural and historical factors that contextualize them.